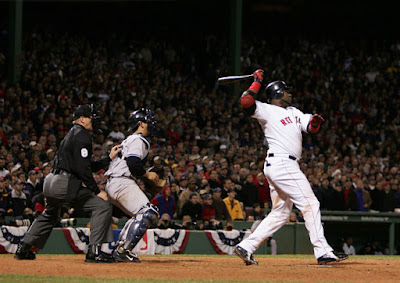 Those of us who were actually at Fenway Park on Sunday, October 17, 2004 will remember the end of ALCS Game Four forever. David Ortiz launched a 12th-inning Paul Quantrill pitch into the night for a 6-4 Boston win. It began the greatest comeback in baseball history. Now, we learn that Ortiz knew exactly what pitch was coming from Quantrill. In a Sports Illustrated interview with Tom Verducci, Big Papi says this, "He threw it to me all the time. When you see him, ask him, What did you throw Papi back then to get him out? Front-door sinker. Because he’s got a good one. It starts at you, and then boom, comes back. But you know what, to be able to do that, you can’t just go out there with an empty mind. You need to have that hard drive all set." The interview also reveals that Ortiz knew Joaquin Benoit would throw him a splitter before he sent a series-changing Grand Slam into the Red Sox bullpen back in 2013. You can read the full SI interview HERE.